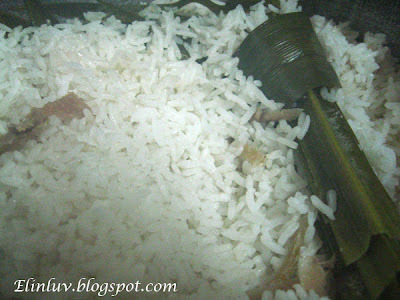 The screwpines leaves (pandan leaves) gave the rice a nice fragrant and the coconut milk gives the rice a more creamy ( lemak ) texture. I added a few shreds of ginger for extra flavor. We had a wonderful and satisfying dinner ^ * . Needless to say , my Piggies were back for the weekend. 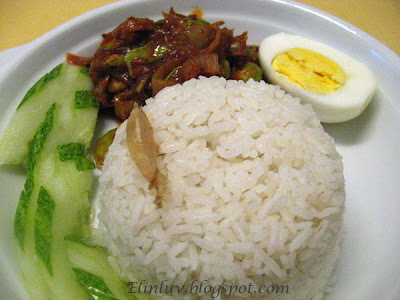 The main attraction for this rice dish is the sambal which is made from these ingredients namely, ground dry chillies , lemongrass ( serai ), shrimp paste ( belacan) and red onions , tamarind paste ( asam jawa) , anchovies ( ikan bilis ) and big onions. Simple and yet when you combined them together and sauté them in hot oil , the heady aroma from these ingredients plus the rich spiciness has made this item a signature breakfast item of Malaysia. Every Malaysian loves it. 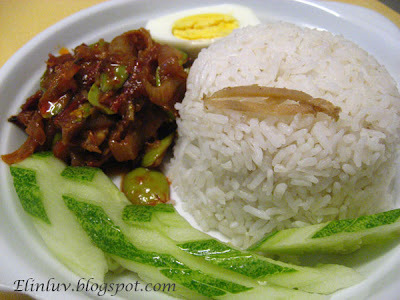 As I watched my Piggies devouring the rice and the sambal and with the oohs and the aahs , I knew it must be good..the sambal with the stinky beans was a hit and I was the happiest Momsie for that hour (",) I enjoy watching them eat their food heartily....especially when I took the trouble to cook them nice yummy food! Add all the ingredients above together in a rice cooker and cook like you normally cook the plain rice. Watch out for the amount of liquid to be added to the grains. The above is for 4 persons. Too much liquid will make the rice soft and lumpy. Heat up 3 tbsp of oil and saute the above ground ingredients until fragrant and the oil has surfaced . Add in the stinky beans and big obnions and stir fry till half cooked, add in the fried anchovies and stir fry it a while . Add in the brown sugar and add in the one cup of tamarind juice. 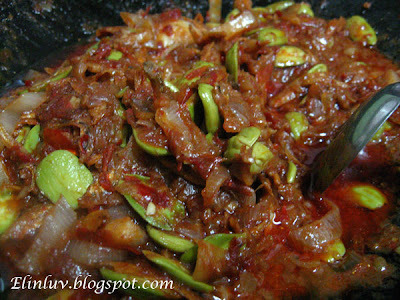 I prefer the sambal to be thick. But if you want to have more gravy then add in a bit more water . Now, in order to cut down intake of coconut milk, I just stick to my fragrant rice with ginger and pandan leaves, no more coconut milk. That rice sounds really tasty, it sounds like a great way to add flavor to rice :). 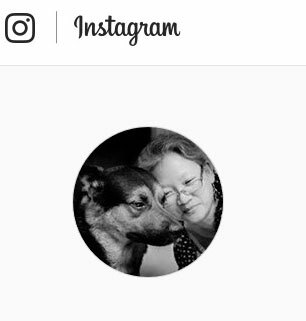 I'd like to include your recipe on our blog, please let me know if you're interested :).